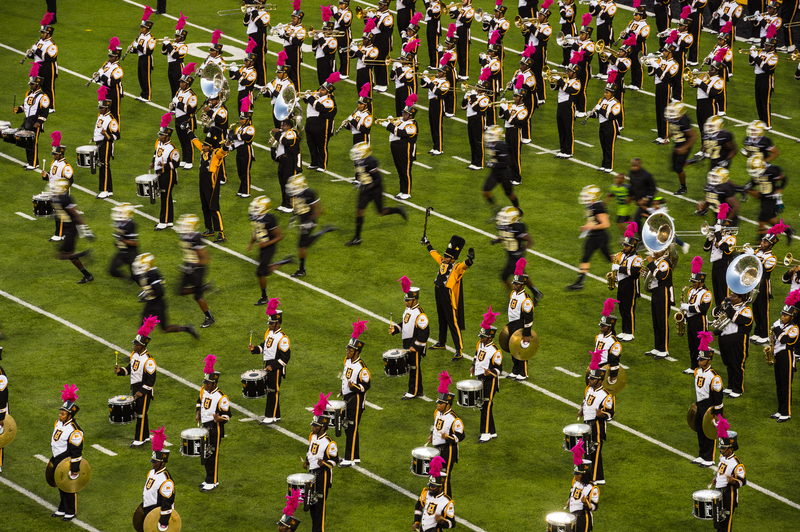 The 5th Quarter in the world of football at historically black colleges and universities (HBCUs) takes place after the game, when the bands of the two opposing schools battle each other for bragging rights as the best musical performance. These displays of musical showmanship, from the choreographed routines to the song selection, require hundreds of hours of practice and hard work by every member of the team. The Undefeated goes behind the scenes to show what goes into pulling off those amazing performances. 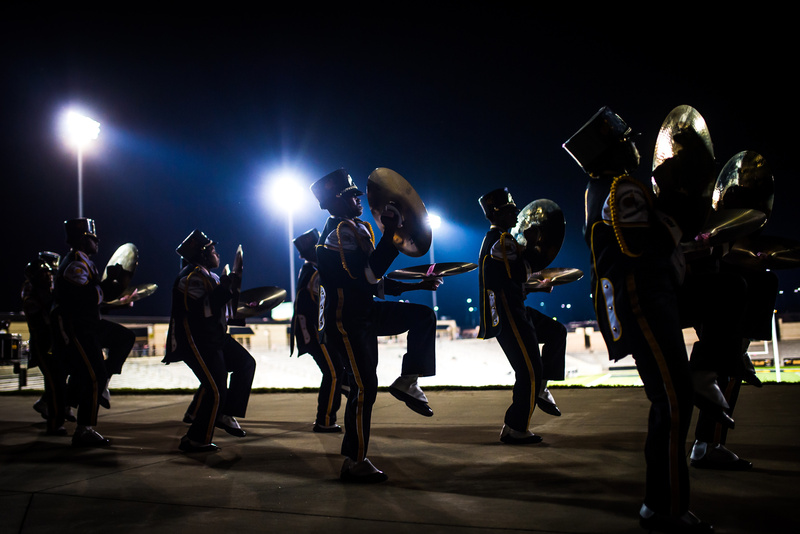 James Oliver, Alabama State University’s director of bands, prepares to dismiss the band after their performance during a home football game against Alcorn State University in Montgomery, Alabama, on Oct. 5. 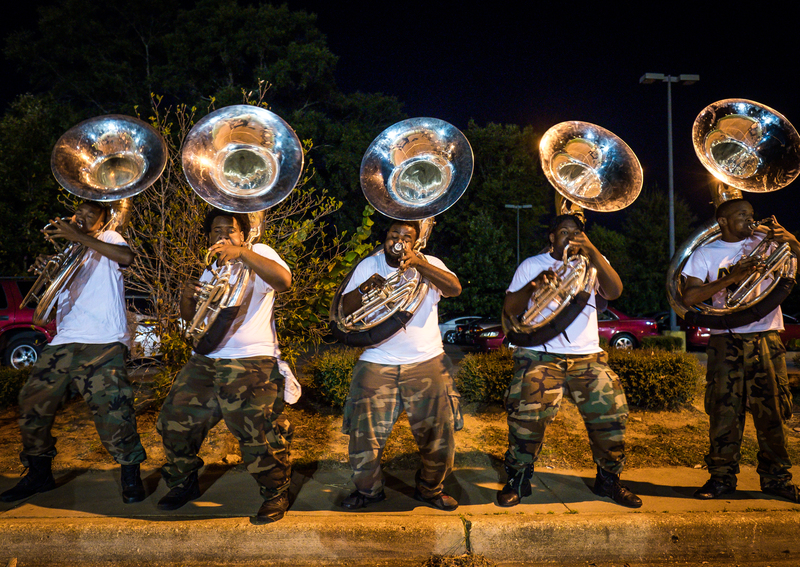 Tuba players in Alabama State University’s Mighty Marching Hornets warm up Oct. 3 during a late evening practice leading up to their performance during ASU’s home football game against Alcorn State University. 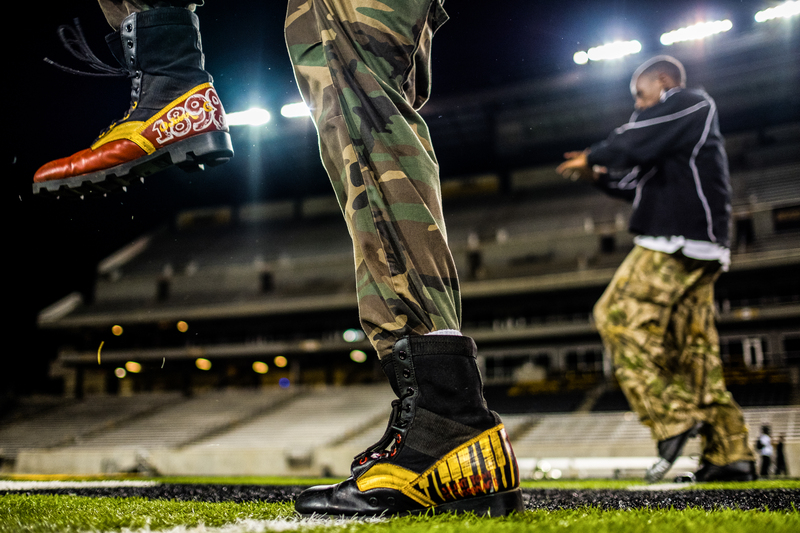 A Phi Mu Alpha member donned boots of the music fraternity during Alabama State University’s Mighty Marching Hornets practice at the new ASU stadium Oct. 4, leading up to the home football game against Alcorn State University the next day. 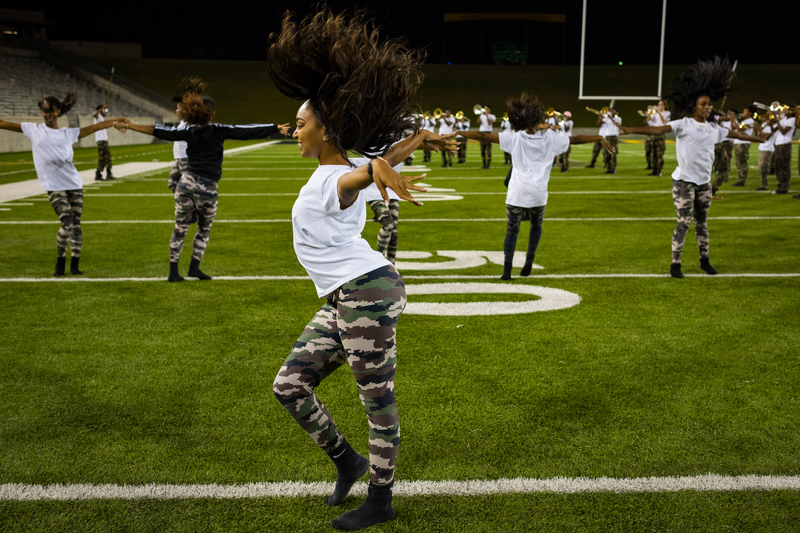 Kaylynn Davis-Lovejoy and fellow Alabama State University Stingettes practice at the new ASU stadium Oct. 4, leading up to their performance the next day during a home football game against Alcorn State University. 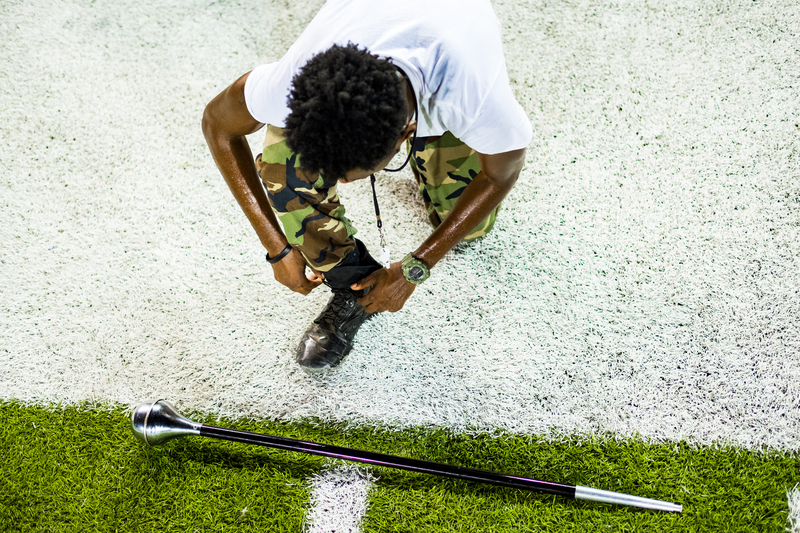 Alabama State University Mighty Marching Hornets head drum major Norris Holimon ties his boot laces during practice at the new ASU stadium Oct. 4, ahead of ASU’s home football game against Alcorn State University the following day. 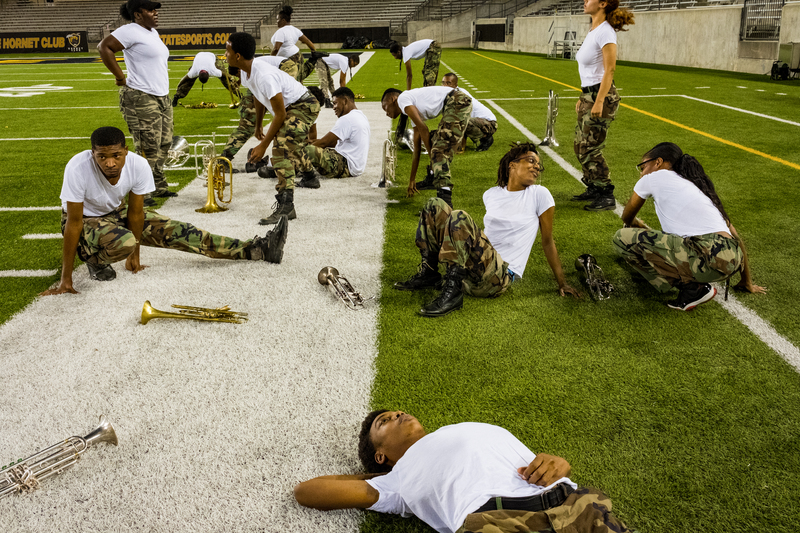 Alabama State University’s Mighty Hornets stretch before practice at the new ASU stadium on Oct. 4 as they prepare for their performance the next day during a home football game against Alcorn State University. 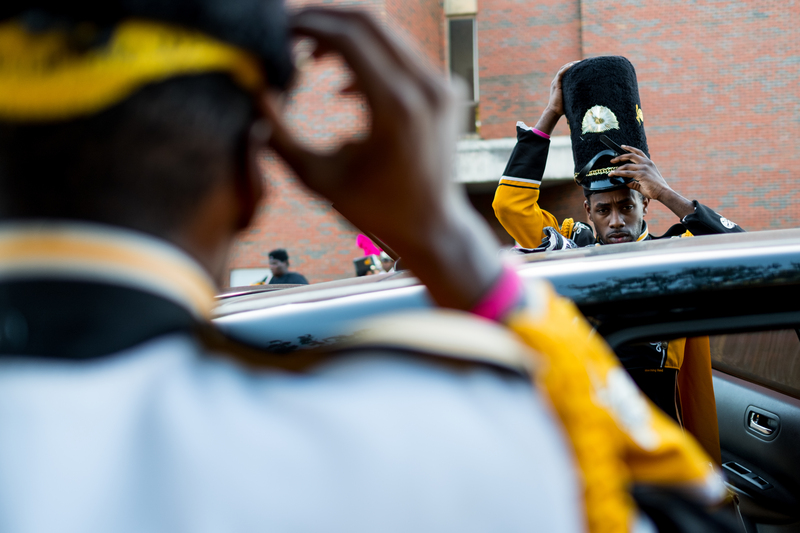 Head drum major Norris Holimon and drum major Robert Jones Jr. don their hats as the Alabama State University Mighty Hornets gather to march to the stadium for a home football game against Alcorn State University in Montgomery, Alabama, on Oct. 5. 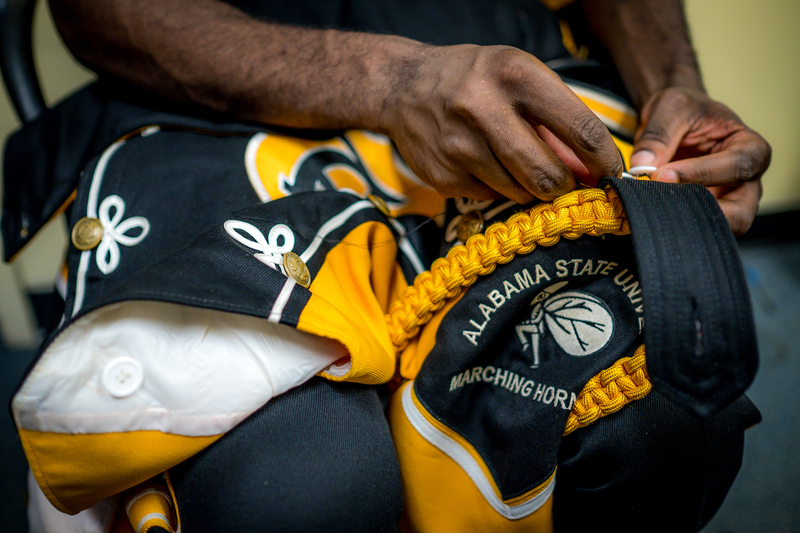 Drum major Robert Jones Jr. fixes a button on his uniform as the Alabama State University Mighty Marching Hornets gather to march to the stadium for a home football game against Alcorn State University in Montgomery, Alabama, on Oct. 5. 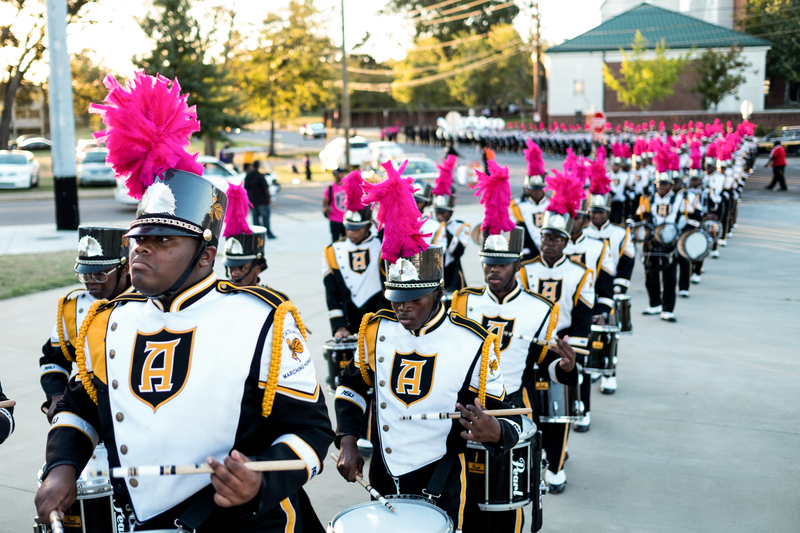 Alabama State University’s Mighty Marching Hornets march to the New ASU Stadium in Montgomery, Alabama, for the home football game against Alcorn State University on Oct. 5. 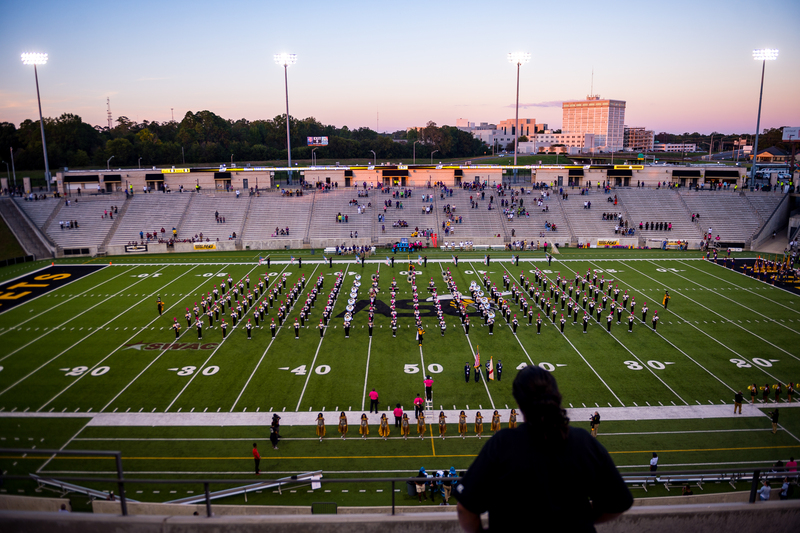 Alabama State University Mighty Marching Hornets perform pregame before ASU’s home football game against Alcorn State University in Montgomery, Alabama, on Oct. 5. “We’re the best band in the land. 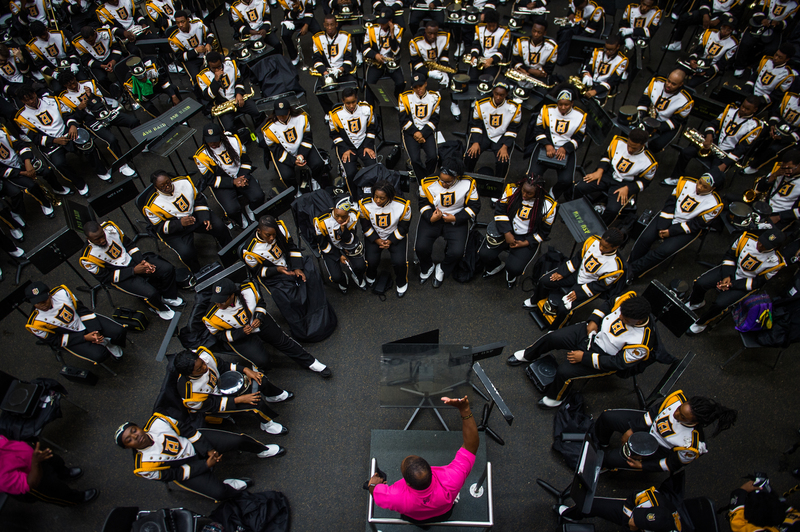 We’re often imitated, but never duplicated,” said Ernest Harris, assistant band director. Alabama State University Mighty Marching Hornets perform as the ASU’s players take the field for their home game against Alcorn State University in Montgomery, Alabama, on Oct. 5. 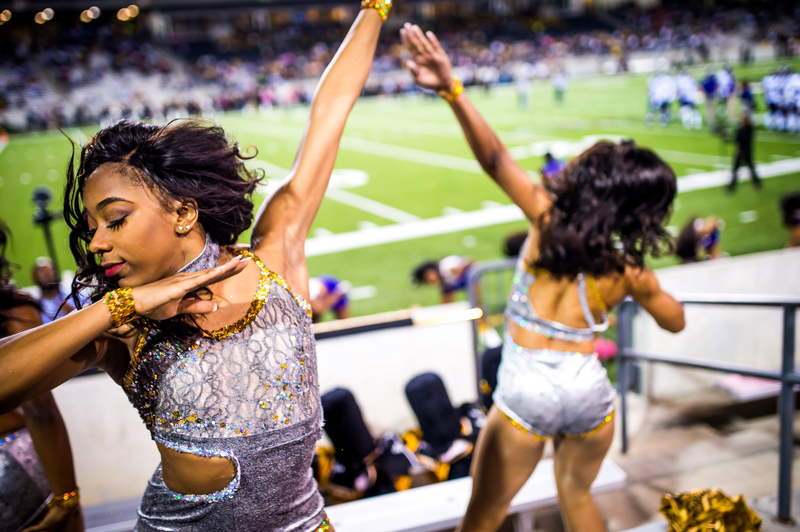 Courtney Smith, left, performs with fellow Alabama State University Stingettes in the stands during a home football game against Alcorn State University in Montgomery, Alabama, on Oct. 5. 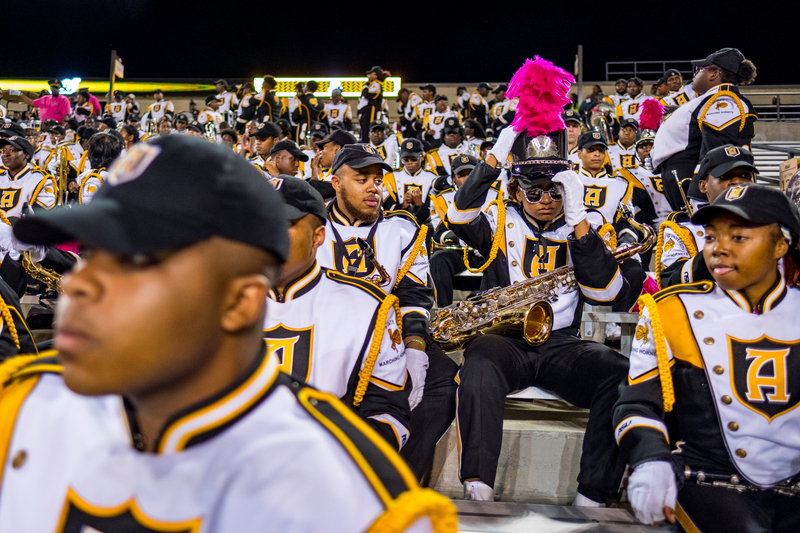 Alabama State University Mighty Marching Hornets saxophone player Travis Williams, center, sits next to fellow sax player Azhae Hylton as she dons her hat in the stands for the halftime show during a home football game against Alcorn State University in Montgomery, Alabama, on Oct. 5. 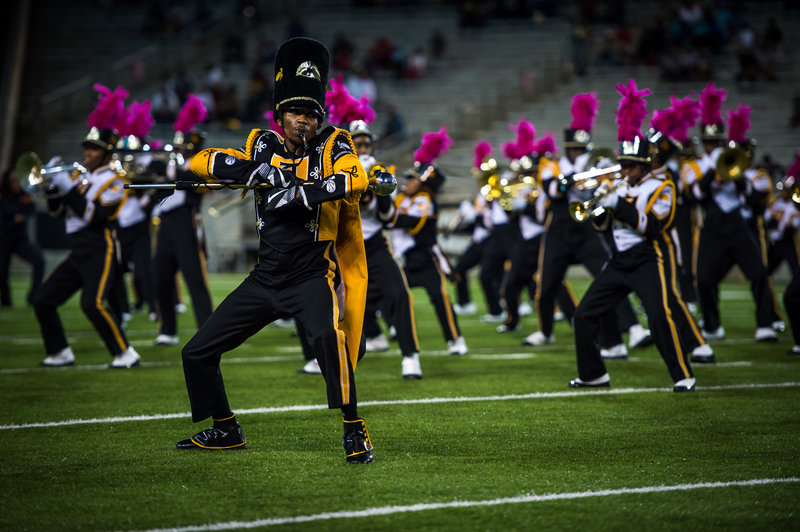 Drum major Anthony White and Alabama State University Mighty Marching Hornets perform the halftime show during the football game against Alcorn State University in Montgomery, Alabama, on Oct. 5. 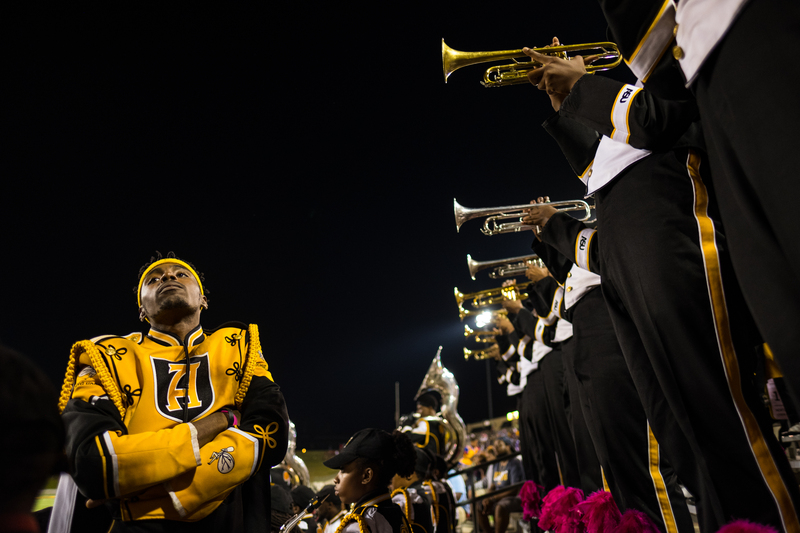 Norris Holimon, head drum major of Alabama State University’s Mighty Marching Hornets, leads the band in the stands during a home football game against Alcorn State University at the New ASU Stadium in Montgomery, Alabama, on Oct. 5.